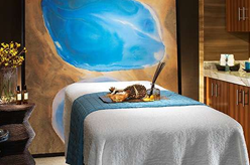 Envelop yourself in Qua's sprawling, 50,000-square-foot spa. You'll forget you're in a desert in this palace of stone flooring, brick facade, and towering waterfalls. 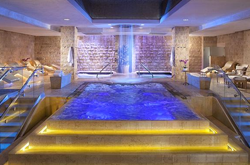 Qua, derived from 'aqua', leans heavily towards luxurious water-themed treatments, including their one-of-a-kind Roman baths. Separate men's and ladies rooms include tea lounges, with specially chosen menus and a personal tea sommelier. After indulging in one of Qua's intensive heat treatments, relax in their Arctic Ice room. The Arctic Ice room is the only one of it's kind in Las Vegas, and features snow that falls from the high ceiling and ice chips to sharpen the senses and awaken the skin. Regardless of the treatment chosen, Qua will leave you feeling refreshed and relaxed.